This quick and simple story is perfect for the littlest of readers. It can be interpreted in any way you like. It can be read when someone or something you love, dies. Or it can be read when you need to say goodbye to someone you love, like a family member moving away perhaps. The flexibility of this book is it’s beauty. 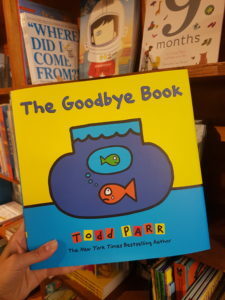 Todd Parr’s signature illustrations can be spotted a mile away, and they are perfect for the little ones. Bright and colourful, they make for a nice and interesting partnership with a sad topic. 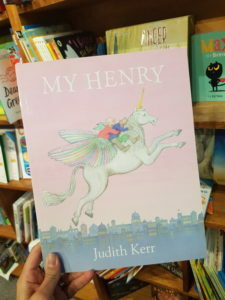 This book is a must have in any young reader’s collection. 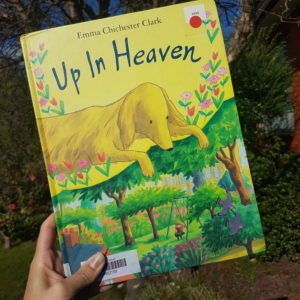 This book is perfect for anyone who has lost a pet. 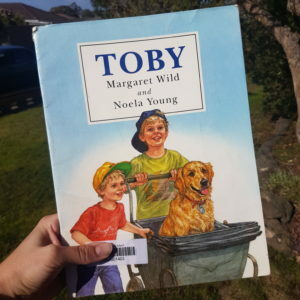 It’s such a nice story about poor old Toby who is aging rapidly and eventually dies. Toby’s owner, Sara, doesn’t get it. “Why is he so slow?” He makes her frustrated and annoyed that he can’t do the things that he used to. This heartwarming story demonstrates that we all deal with grief and loss differently. Where Sara’s brothers are kind and gentle towards Toby, Sara has a really hard time accepting that he is dying (eventually is put to sleep). As humans, we all grieve in different ways. We all need to be kind to each other and tolerant of each other’s feelings. Watching your pet get old and slow can be sad and scary for a child. Making the choice to put him to sleep can be even harder. Read this story to your little one to explore the range of feelings that may come with grief, and discuss how all of those feelings are OK and normal. Arthur has a dog named Daisy. And Daisy loves Arthur soooooooo much. But Daisy is now very old, and lately she’s finding it hard to keep up with Arthur. One night, after she goes to sleep as usual, she wakes up in heaven. Heaven is a wonderful place, and Daisy loves it there. But she knows Arthur is sad and misses her. So Daisy finds a way to let Arthur know she’s happy—and that’s the first step toward making him happy again, too. She visits Arthur in his dreams, and tries to show him how much fun she is having in heaven. She even sends him a dream of Arthur getting a new little puppy so he can move on and love something again. Arthur eventually gets a new puppy, but just because he has a new puppy, it doesn’t mean he will ever forget his old friend Daisy. I LOVE this story because it’s sweet and peaceful, and doesn’t pull on the heart strings too much. If you use the term “heaven” in your household, then this book is for you. If you are not really into the idea of “heaven” then perhaps pass on this one. Little Bear loved his Grandad. He loved him so much that he visited him every Friday. Grandad shared stories with Little Bear and shared beautiful times in the Tree House at the top of the garden. But one day, Grandad was taken to hospital, and was too weak to play or tell one of his stories. So Little Bear decided that he would tell Grandad a story instead. Afterwards, Grandad falls into the deepest sleep. This beautiful story will make your eyes well up I’m sure. 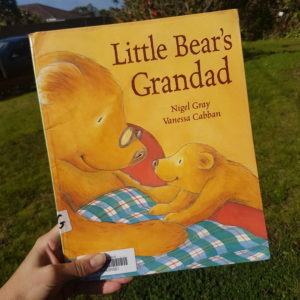 The idea of Little Bear telling his Grandad a story is so touching and sweet. Definitely get your hands on this one if a close grandparent has passed away. 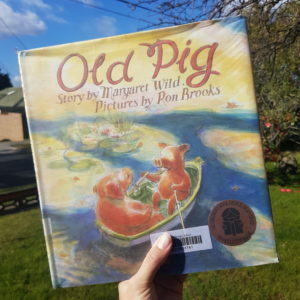 Old Pig by Margaret Wild is an emotional story about Old pig and Granddaughter who’ve lived together for a very long time. They’ve taken care of each other and have enjoyed their days doing things together. As Old Pig has grown older, she’s unable to do the things she used to do and gets more and more tired with each day. Granddaughter learns to cherish every moment she has with Old Pig and now pays closer attention to all the beautiful things we are gifted with here on Earth. Margaret Wild’s writing is perfection! It provides us with a great lesson about loving and learning how to let go. Ron Brooks’ illustrations match beautifully. This one. This is the one that touches me the most. Before my Grandfather passed away he lost his wife 3 years ago. He missed her terribly after she passed. So I can relate to this book so very much. Even though the widow/widower roles are reversed in our case. A widow imagines her late husband, Henry, joining her for all sorts of beautiful adventures. Even though he is not on Earth with her anymore, she can still have a wonderful time with him. In her mind. In her imagination. They ride a dinosaur and swim with mermaids too. A peaceful yet bittersweet story that is for the older readers. Perhaps even for adults. It’s perfect for anyone who has loved and lost their partner in crime, and need some help through such a sad time. I guess what Judith Kerr wants to express is that, even though your loved one’s body is no longer on Earth with us, they will always be in your mind and heart. I hope this list has been helpful in your mission to tackle bereavement with your little readers. I certainly enjoyed collecting and reviewing these beautiful stories for you guys!